The Roman Catholic Church is a global power force that connects people from every continent on both an ideological and spiritual level. Despite its sizable influence, the church's moral authority has waned in recent years because of discoveries of systemic child abuse matched with the continuation of dogmatic regulations regarding the sexual practices of its international congregation. The Catholic Church claims that homosexual identity is not inherently wrong, but becomes a sin when transformed into action. These types of discriminatory declarations have cast deeply painful shadows over LGBTQ (Lesbian, Gay, Bisexual, Transgender, Queer) communities around the world, and have painted non-heteronormative identities as dangerous and shameful. 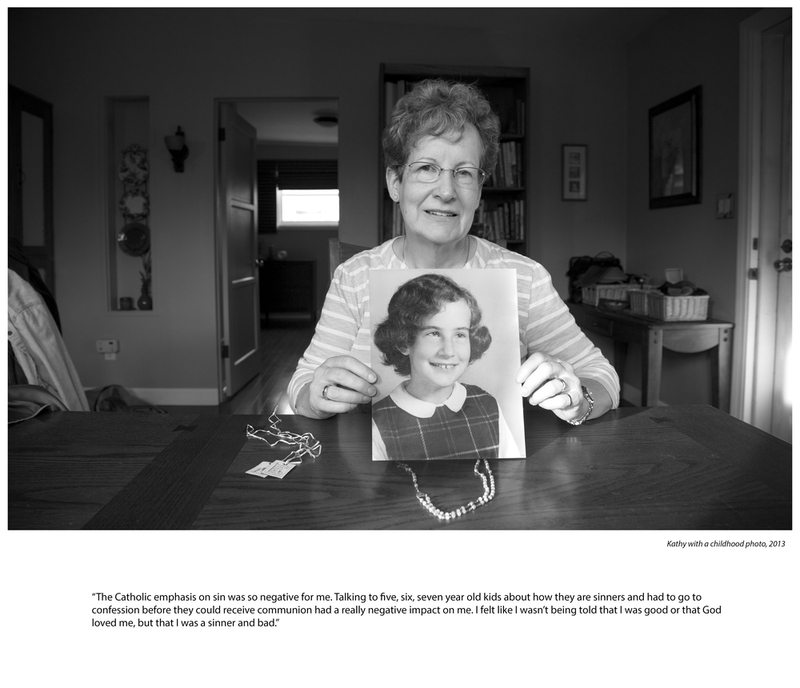 To personify this current situation, I am using photography, oral interviews, personal writing, and archival material to investigate LGBTQ experiences under the influence of Catholicism in the U.S. I am invested in the ways in which society perceives and represents queer-identified people, and how struggles for inclusion have, in turn, shaped Catholicism. My process begins with a recorded conversation about an individual’s experience with Catholicism, followed by a portrait session in a home, church, or at a nearby café or park. The interview is never limited to one meeting, and acts as more of a dialogue where subjects collaborate in its outcome. This verbal method, paired with photographic visuals, allows me to delve deeper into the fractioned subjectivities and experiences within a larger social framework that can help uncover systems of power that contribute to the creation and maintenance of oppression. The importance of first-hand accounts will enliven ideas from the past to unveil complex and tangled representations in current understandings of religion and sexual identity. 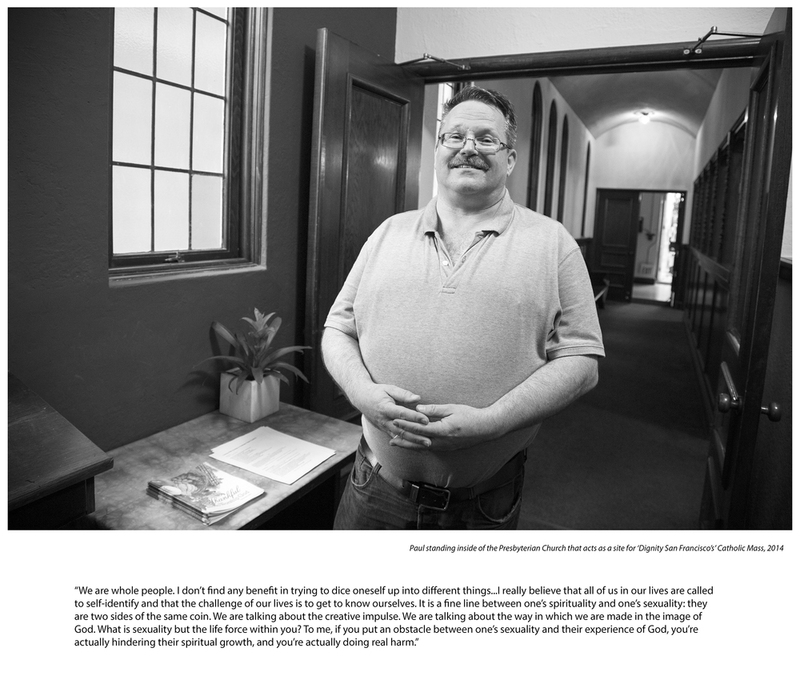 Although this project is specific to the ways in which Catholicism has affected LGBTQ identity, I expect the resulting photographs and collected historical material to encourage broader conversations about the amalgamation of organized religion, ideology, sexuality, and spirituality. I also hope to advance the current conversation of "We're here and we're queer" to "How/why/when/where are we here and queer?"